Pizza is arguably the most loved food all over the world. However, mastering the art of making the perfect pizza takes time and a lot of practice. Preparing it homemade with a golden-brown crust, the ideal ratio of sauce and toppings and mozzarella is no small feat. From how long you should mix the dough to how long you should keep it in the oven, making a delicious pizza is all about the minute details. Here are some tips which guarantee you can make the perfect pizza in the comfort of your own kitchen. Less is always more while mixing pizza dough. Add all the ingredients in a bowl and keep mixing till everything is combined well and thoroughly. However, do not over mix the flour as it may cause the dough to become dry and tough. Use an automatic mixer if you want to avoid getting your hands dirty and making a mess. There is nothing worse than having a doughy pizza which tastes like plain bread. It’s essential to make the pizza dough using the correct kind of flour and to work it until its texture becomes elastic. Spread it out thin before adding the toppings. To ensure your dough gives the perfect crust to the pizza, you must be patient and set aside ample amounts of time. Using high protein wheat flour with salt can give the best results. Also, if your aim is to make a traditional pizza, you should ensure that the dough is elastic enough to be stretched completely by hand without a rolling pin. Originally, pizzas were made by throwing any scraps and leftovers together on some bread. But the food favourite has evolved a lot since then. Many top chefs believe that a perfect pizza is made with no more than a couple of ingredients. This may come as a surprise to most pizza lovers but what must be realised is that when too many ingredients are used, the main ingredient loses its distinctiveness. Using quality cured meat such as pepperoni or salami works well as they provide great flavour by themselves and don’t need too many other ingredients. If you want to provide flavour and texture, incorporate pulled lamb or pork as the topping. Many other meals generally need to be baked for longer to ensure all the ingredients are cooked thoroughly. However, pizzas are cooked using higher heat and for a shorter period of time. If you’re using ingredients which need to be cooked thoroughly, like vegetables and meat, the best thing to do is to pre-cook them before adding them to the pizza. This ensures that the ingredients don’t carry much water, turning the texture of the pizza soggy. The quick cooking process makes the pizza light, crispy and dry, which is part of the reason its loved by everyone. Most top chefs believe adding the finishing touches such as basil or a squirt of lime or lemon juice should be done after the pizza is completely cooked. With specific toppings, the pizza might taste different, but exploring variety is the fun side of creating the perfect pizza. 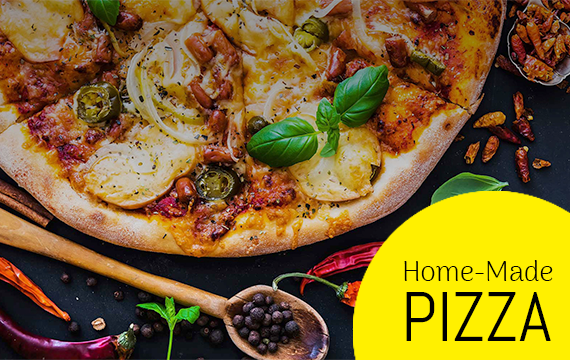 Homemade pizza is great as it’s easily customizable depending on your preferences and can help you control the ingredients being used. These tips will ensure you ditch the takeout menu and cook the best homemade pizza.